As SCAG looked ahead to the development of the 2016 Regional Transportation Plan (RTP)/Sustainable Communities Strategy (SCS), the region stood at a crossroads. Was the 2012 RTP/SCS “sustainable enough”? How much more ambitious could it be? 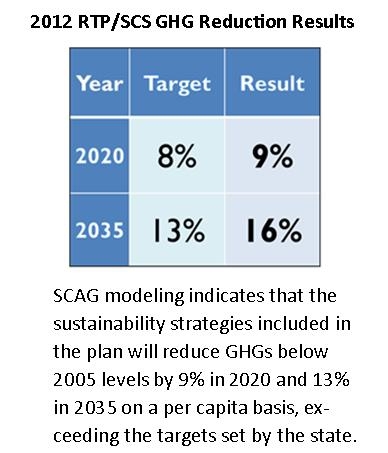 SCAG recognized that it was critical for its major policy decisions from that point forward to be backed by solid technical analysis that focused on sustainability and allowed SCAG to find ways to improve its RTP/SCS in the face of dwindling resources. To this end, INVEST provided an instrument by which the 2012 RTP/SCS could be scored and evaluated for the purposes of identifying both strengths and weaknesses focused upon the three principles of sustainability – environmental, economic, and social. SCAG developed the 2012 RTP/SCS, which utilizes a system management approach based on comprehensive system monitoring and evaluation and the use of performance measures to ensure that the best-performing projects and strategies are included in the RTP/SCS. Effectiveness of SCAG’s broad spectrum of expertise and balanced approach to planning. INVEST also revealed several areas of improvement for SCAG. 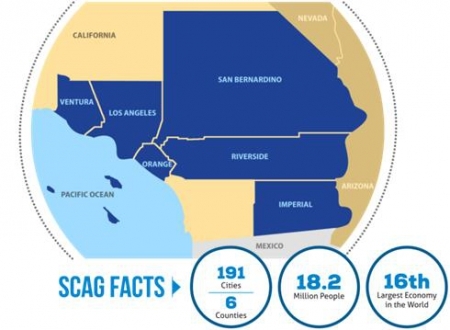 As detailed in the report, SCAG is already doing most of what it is able to accomplish given its institutional, data, and resource limitations. 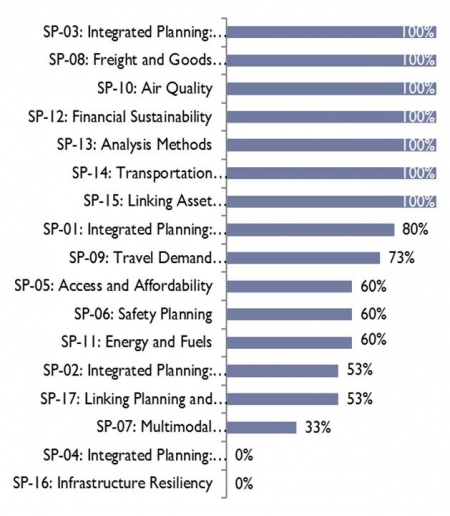 However, one INVEST criteria stood out among the others as a major opportunity area for the agency: Infrastructure Resiliency (SP-16). SCAG earned 0 points in this criterion—the only non-bonus criterion that it did not earn any points in. While the eventual goal of SCAG should be to fully satisfy this criterion and integrate an Infrastructure Resiliency plan into the long-range transportation plan, this will likely take a substantial amount of time, resources, and planning. Therefore, in the near term, as a starting point, the team recommends that SCAG develop a white paper to assess the feasibility of developing a Regional Infrastructure Resiliency plan that will provide a blueprint for SCAG’s future engagement in this area. Strengths: SCAG earned a full score as a result of years of developing regional goods movement plans in close collaboration with stakeholders. Almost half of the nation’s shipping containers is handled by the region’s freight infrastructure.The industry sustains 2.9 million jobs in the region alone. At the same time, there are daunting challenges, as congested highways and rail corridors serve as a barrier to keeping the economy growing and as a risk to public health. To address these challenges, SCAG has continued to actively participate in the Southern California National Freight Gateway Collaboration, through which regional, state, and federal transportation and resource agencies work together to explore ways to support the movement of goods, the economic health of the region and nation, and the health of Southern California’s communities. 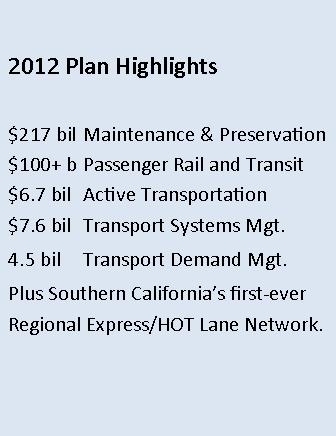 As a result of this work, SCAG was able to include in the 2012 RTP/SCS an ambitious plan to achieve the Collaboration’s vision of developing a world-class coordinated Southern California goods movement system that accommodates growth in the throughput of freight to the region and nation in ways that support the region’s economic vitality, attainment of clean air standards, and quality of life for the region’s communities. 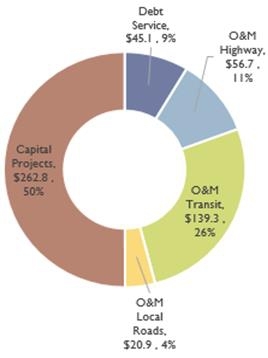 Key goods movement investments included in the 2012 RTP/SCS include: rail safety and grade separations; mainline rail improvements and expansion; bottleneck relief strategy; environmental strategy (i.e. zero- and near-zero emission freight system); East-West Freight Corridor; On-, Near-, and Off dock rail improvements. Recommended SCAG Action: Continue current efforts.